Situated some 90 miles from Las Vegas, Nevada Yucca Mountain is currently the only site that has been studied in detail for geological disposal of spent nuclear fuel and defense high-level waste. There are ten (10) designated Affected Units of Local Governments (AULG's) in relative proximity to Yucca Mountain. These AULG's have been granted authority to provide information and public involvement opportunities regarding federal decisions about Yucca Mountain. 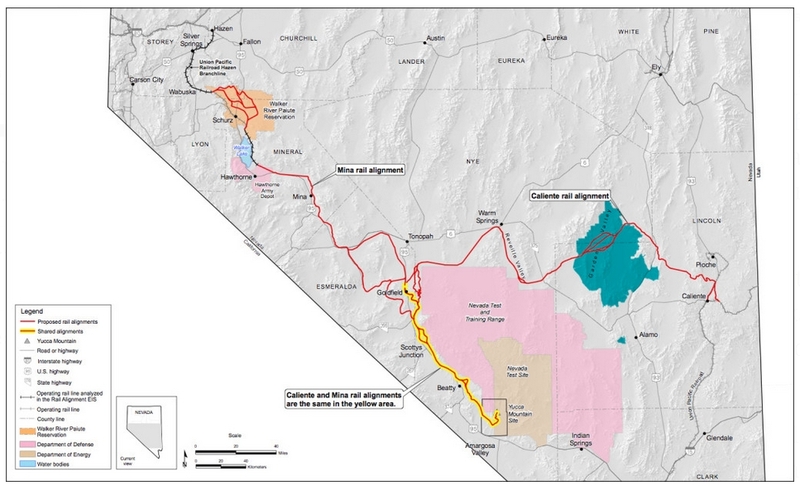 Accordingly, Eureka County, Nevada [a designated AULG] is the host of YuccaMountain.org. On this website you will find current news clippings, documents, photos, maps, and much more on the history and key issues surrounding the proposed and controversial Yucca Mountain repository project. Senate Coalition Introduces Comprehensive Nuclear Waste Legislation [PDF, 2 Pages] [More] [Bill Text] — U.S. Senate.